I applied too much paint to my design. How can I correct my mistakes? What is the best way to repair a torn stencil? My stenciled designs are not crisp, but rather blurry and jagged. What am I doing wrong? How do you stencil on rough textured walls? What is the easiest way to remove my old wallpaper border before I begin my stenciling project? How do I remove adhesive spray from the back of my stencil? There are several solutions to this problem: 1) Remove as much of the paint as possible, allow the area to dry, then paint over the area with your base color. 2) If the paint is still wet, use a rag/towel moistened with a mild soapy solution, plain water or isopropyl alcohol. Gently wipe the problem area. Allow to dry and continue stenciling. 3) Plaid makes a product called the Stencil Eraser that helps to remove minor smudges. Check manufacturers instructions before using. Lay the stencil on a flat surface. Apply a small piece of tape (scotch tape or clear shipping tape) to the front and back of the torn section. Use a razor blade or craft knife to trim the tape even with the edge of the design. Stenciled designs that are not crisp usually mean that you are overloading your brush. Loading your brush with too much paint is by far the most common mistake that are made by both beginners and pros. Dip the tips of the bristles of your brush into the paint. 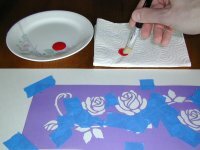 Using a paper towel remove most of the paint from the brush by swirling the brush into the paper towel. There are several kinds of textures that home builders use, ranging from a slight texturing (orange peel) to the more heavily textured such as popcorn. We do not recommend stenciling on the more heavily textured walls unless you are willing to smooth the wall a bit before you stencil. Smoothing is accomplished by sanding, application of spackling followed by a light sanding or wet sanding of the area (especially true for ceilings). Keep in mind that a fresh coat of paint after spackling and sanding is a good idea. If you are absolutely fixed on stenciling textured walls, you'll have more success if your wall is lightly textured, if choose a more open, flowing design instead of one containing tiny designs, and if you use stencil cremes instead of liquid acrylics. If you are not sure if stenciling will work on your textured wall, purchase a cheap stencil at Wal-Mart (or make a simple one out of thin cardboard or plastic) and test a small portion of the design on an inconspicuous area of your wall first (closet). Simply peel away what you can and then the rest of the border can be removed by mixing liquid fabric softener with hot water (about one cup fabric softener to a gallon of hot water). Just mix up the fabric softener and water, take a sponge and thoroughly saturate it with the solution and "wash" the area of border that didn't come off. Wait a few minutes and then take a scraper and remove. We recommend a product called "Sticky Out" by Elmers. Apply a light coat on the affected area, wait ten minutes and wipe it off.